Readers of the blog will be fully aware that I’m not the great fan of board games. Don’t get me wrong, I do love a game of monopoly to bring out the competitive streak, but it’s not a go to hobby if mine. However when Lancashire Farm Dairies got in touch about trying their novelty board game I jumped at the chance… why? The game involves food and not only that, but food that is totally acceptable when following the Keto Lifestyle! Liv, like most children absolutely loves yogurts that have ‘extras’ that you need to mix into the actual yogurt. Offering different flavours, textures and taste sensations, anyone can spice up the yogurt with extra toppings, whether old or young! Alongside the Lancashire Farm Dairies Toppers board game were lots of yummy toppings… and a banana that we mix in with the Natural Bio Yogurt, Greek Style Natural Yogurt and Fat Free Natural Yogurt. Lancashire Farm Dairies produce a fantastic range of yogurts that are suitable for vegetarians and are gluten free alongside having so many fantastic health benefits associated with them. Lancashire Farm Dairies only use 100% locally sourced, fresh free range milk in their range, whilst ensuring no artificial colours of flavours are used. Basically, they are good to eat for anyone of any age and not only as a yogurt meal… natural yogurts are great for using in cooking too! To play the Lancashire Farm Dairies Toppers game we simply had to roll the dice to choose a topping for the chosen yogurt. It was so easy that even I could play it… Every person who plays Toppers is definitely a winner! We picked the Greek Style Natural Yogurt so that I could have a little try too and rolled the dice to let fate decide the chosen toppings. Albeit the dice chose cornflakes and honey crunch for Liv, there really was too much choice for her and the finished bowl of Lancashire Farm Dairies Greek Style Natural Yogurt also included strawberry sauce and chocolate chips too! Liv definitely made it her own but had great fun doing so. The combinations of toppings you can add to yogurt are limitless, you can be as brave as you like or simply add granola or cornflakes to add a completely different texture to the dish. The greatest benefit to yogurt, besides the health benefits is the fact it isn’t just meal inspiration of breakfast, it can be enjoyed at anytime during the day and is the perfect snack idea for cuddling up on the sofa with a Sunday afternoon film. This was Liv’s first attempt at eating Greek Style Natural Yogurt and whilst she found it quite rich and tangy, the strawberry sauce helped to give it a sweeter taste. It has certainly given us food for thought and will look for more topping inspiration on our next food shop. As a parent, I am much happier with my child eating a bowl of yogurt and sensible toppings as opposed to chocolate and crisps. Despite the fact the Lancashire Farm Dairies Toppings game is novelty, it has actually given us some great inspiration and think that yogurt will be more of a staple in our fridge now. The fact natural yogurts have a longer shelf life is a bonus! From my side, following Keto means any carb laden foods are simply out of bounds, however natural and Greek yogurts contain the smallest amount of carbs amongst all yogurts and are approved on the lifestyle. With this in mind, I purchased some flavour drops from MyProtein a while ago with the intentions of picking up some yogurt as a treat. I forgot many times! Working on this post though meant that I could finally try the drops with some natural yogurt, adding more meal options to a very meat focused lifestyle. It was absolutely glorious! So refreshing, smooth and cooling. Anyone on Keto will agree ice-cream is a much missed food, but this is the closest you can get without feeling guilty. At 6.5g of carbs per 100g of Lancashire Farm Dairies Greek Style Natural yogurt, that is quite good as the chances are you aren’t going to eat 100g in one sitting (or one day!). A small bowl with the droppings or even a few strawberries is a fantastic keto treat option. 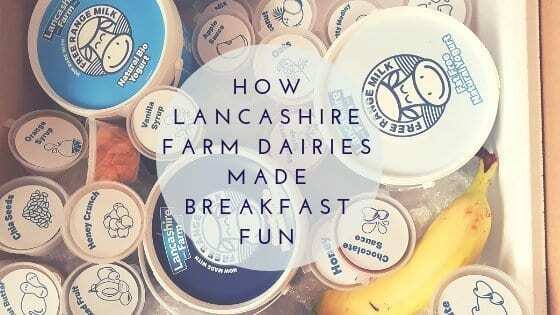 Not only do Lancashire Farm Dairies produce natural yogurts, but they have quite an extensive range – so make sure you check out their products and find out more about their story and ethos over at their site here. You can pick up the range in most grocery stores such as Tesco, Sainsbury’s and Asda. Ooh I’m loving some of these ideas. I love yougurt and I’m always looking for ways to make it yummier! I think my eldest daughter would love this – she’s a fan of any sort of sprinkles she can put on food and a roll of the dice might be a much quicker way of getting her to decide anything! Yum! I love your yogurt and so many fab ideas! It’s quite crazy how much you can use yogurts for different recipes, such as dips 🙂 I must also say, I do love My Protein products too, especially the peanut butter flavour drops!! I love yoghurt with some fruit for breakfast. Lancashire Farm’s is great too! What a great idea! I love the look of these, so many choices!